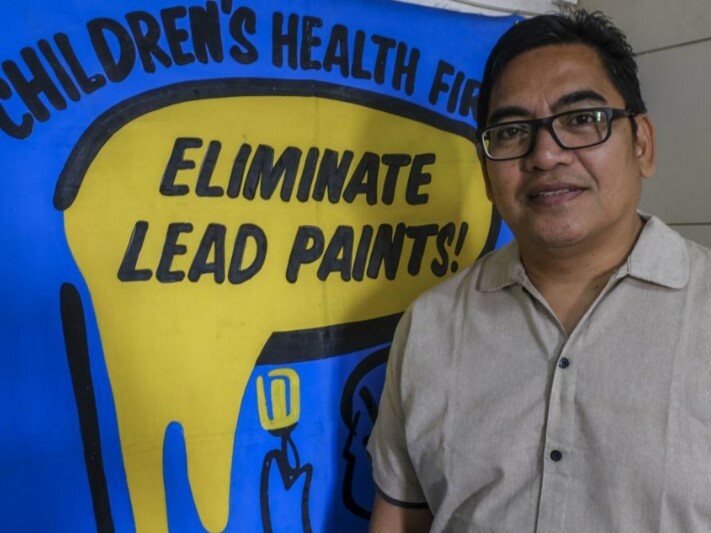 Lead-safety Message: Manny accepted the prize on behalf of stakeholders who promoted safeguards against lead paint for nearly 12 million young children. Together with the non-governmental organization, Ecological Waste Coalition of the Philippines, Inc. (EcoWaste Coalition), he engaged civil society, policy makers and paint manufacturers to build momentum in the Philippines for the adoption of a law banning lead paint production, use and sale. The support from key stakeholders, especially local paint manufacturers, laid the groundwork for the adoption of the national law with 85% success rate. Together we can keep children around the globe safe by eliminating lead paint. Keywords: Ban Lead paint, Keep Our Children & Workers Safe, Eradicate Lead Paint, Lead Paint Exposure Awareness. Description of Work: Photo of Manny Calonzo and the Children’s Health First poster.